Photograph, Courtlandt Place Plot Survey, ca. 1910. Image courtesy of Houston Area Digital Archives. Image available on the Internet and included in accordance with Title 17 U.S.C. Section 107. Photograph, Picture of the historical marker for Courtlandt Place. Image available on the Internet and included in accordance with Title 17 U.S.C. Section 107. COURTLANDT PLACE HISTORIC DISTRICT. 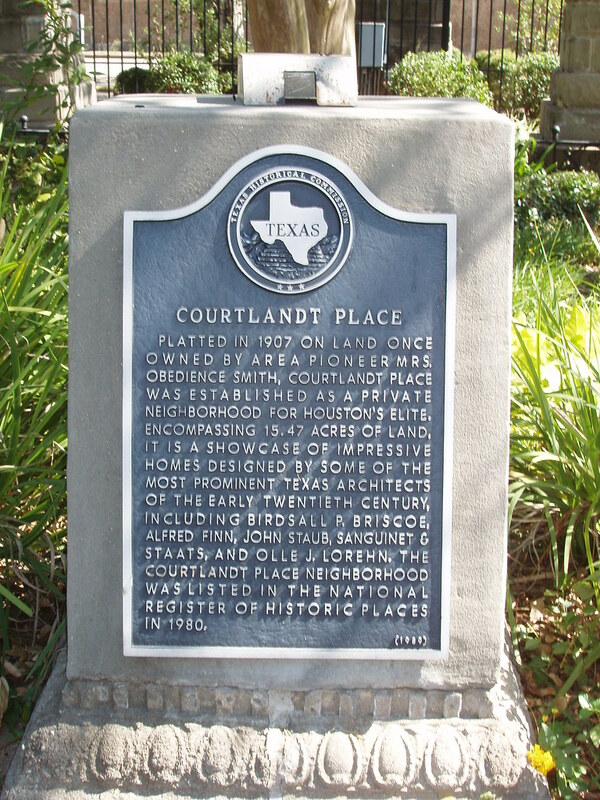 The Courtlandt Place Historic District is one of Houston's earliest elite residential subdivisions. Modeled on suburban planning developed in St. Louis and known as the "private place," the district is an example of neighborhoods built as small private enclaves in response to the urban chaos of Houston in the early 1900s. Courtlandt Place centers around a one-block-long, tree-lined, divided boulevard, where eighteen examples of early twentieth-century architectural styles flank the street. The residential enclave began in 1906, when the Courtlandt Improvement Company purchased the land and laid out the subdivision on the southern edge of the city; the first houses were built in 1909. Gateways at the end of the central boulevard limited access to residents only, while deed restrictions stipulated land use, minimum cost, and house size. The Courtlandt Association, founded in 1912 by property owners, enforced these restrictions until the 1930s. Residences were built for entertaining at home; among them were houses designed by Sanguinet and Staats, Birdsall P. Briscoe, John F. Staub, and Warren and Wetmore. Courtlandt Place served as a model for Montrose in 1910, but subsequently was replaced by new designs for suburban living. Early residents were the old elite of Houston, known for their "congeniality in philosophy and politics," and frequently related. The district was admitted to the National Register of Historic Places in 1979 and received a Texas historical marker in 1989. Howard Barnstone, The Architecture of John F. Staub: Houston and the South (Austin: University of Texas Press, 1979). Stephen Fox, Houston Architectural Guide (Houston: American Institute of Architects, Houston Chapter, 1990). Houston Metropolitan Research Center Files, Houston Public Library. Handbook of Texas Online, Diana J. Kleiner, "COURTLANDT PLACE HISTORIC DISTRICT," accessed April 23, 2019, http://www.tshaonline.org/handbook/online/articles/ghcwm.